Annotation: A groundbreaking work of LGBT literature takes an honest look at the life, love, and struggles of transgender teens. 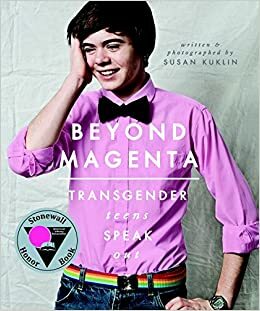 Summary: Author and photographer Susan Kuklin met and interviewed six transgender or gender-neutral young adults and used her considerable skills to represent them thoughtfully and respectfully before, during, and after their personal acknowledgment of gender preference. Portraits, family photographs, and candid images grace the pages, augmenting the emotional and physical journey each youth has taken. Each honest discussion and disclosure, whether joyful or heartbreaking, is completely different from the other because of family dynamics, living situations, gender, and the transition these teens make in recognition of their true selves. Book Talk: Everyone sometimes feels like they are uncomfortable in their body. But imagine if your feelings went deeper. Imagine you felt, or just knew, that you were born into the wrong body. That how you felt inside just didn't match your outside appearance. What would you do? What if you knew you just couldn't keep living this way? Beyond Magenta examines what this is like through the stories, pictures, and experiences of six transgender and/or gender fluid teens. Read about the different challenges both within themselves, and with the acceptance of others, that each teen faces during their journey of becoming who they really are. 1. What are some of the assumptions people make based on perceptions of gender? What pressures do family, friends, and society place on a person based on their perceived gender identity? 2. Jessy first came out as a lesbian, and later as trans. How did the two experiences differ? Was one more difficult than the other for Jessy? Why or why not? 3. During Jessy’s early high-school years, he didn’t know what the word transgender meant. “Hey, if you like women and you’re a woman, then you’re a lesbian” (page 7). How important is terminology in knowing one’s self? Do you think kids today know more about gender diversity? 4. Jessy’s girlfriend, Nan, refers to Jessy as “she.” Why do you think this is? Why do you think Jessy doesn’t mind? 5. Christina says, “The other day I was thinking, I really, really hate being a transgender. It’s a constant struggle. It’s so annoying” (page 33). Why do you think Jessy and Christina have such different feelings about being trans? 6. Christina was bullied in elementary and high school. Have you ever witnessed someone being bullied for being perceived as LGBTQ? What happened? What did you do? 7. Christina’s counselor tells her that if she wants to transition she should “do it after high school” (page 42). Why do you think he gave this advice? Do you agree with it? What do you think are the benefits of transitioning when you’re younger? What could be some drawbacks? 8. Christina talks about getting her nails done and getting her school uniform sweater tailored to look more feminine. Why do you think clothes and fashion in general are so important to gender identity? 9. Christina says, “I think the other students were freaked out because I looked like a girl and I was pressing against gender boundaries” (page 49). Why do you think some people get upset when someone challenges gender boundaries? Does it ever upset you? 10. Mariah requested that no photographs of her appear in the book, saying, “I’m not a success story right now” (page 74). Why does Mariah think this? 11. Mariah says, “Everyone goes through one kind of transition or another. We go through transitions every day. Except mine is maybe a little extreme. I’m not at the end of my transition. I’m barely at the beginning” (page 91). What sorts of transitions has Mariah gone through in her life? What sorts of transitions have you gone through or think you will go through in the future? 12. Cameron says, “Gender is one variable in a person’s identity, and sexual orientation is another variable. The two are not connected. Being trans is not the next step to being gay” (page 95). In contrast, both Christina’s and Jessy’s best friends continued to think they were gay, even after they came out as transgender. Christina’s friend asked her, “Why can’t you just be a gay man?” (page 43). How are gender identity and sexual orientation connected, if at all? How do they differ? Why do you think some people seem more able to accept that a person is gay or lesbian than transgender? 13. Cameron says, “Being trans is not something that is accurately portrayed in the media” (page 112). What portrayals of transgender or gender-neutral people have you seen in the media? Are they accurate? Why or why not? 14. Why do you think Nat wanted to be photographed in black-and-white? 15. Nat says, “When the doctors confirmed that I was intersex, I thought, Wow, I’m that whole other gender! It proved what I had been feeling all along. I was not only emotionally, psychologically, and spiritually both sexes; I was physically both sexes, too” (page 136). How does Nat experience gender compared to some of the other teens? 16. Luke says, “There’s a lot you can say in poetry that you can’t say in conversation” (page 152). Why do you think it’s easier for Luke to speak his mind onstage in front of an audience of strangers than in conversation with people he knows? 17. How did Luke’s acting affect his coming-out process? 18. Photographs are a very important part of Beyond Magenta. What do you learn about each teen from looking at his, her, or their photographs? 18. Photographs are a very important part of Beyond Magenta. What do you learn about each teen from looking at his, her, or their photographs? 19. Mariah identifies as being transgender, while Cameron talks about doing gender. How do you think their gender identities or expression differ? 20. Several of the teens discuss ways in which society, aside from their families, began to treat them differently after they began transitioning. What observations did they make? 21. How did being transgender, intersex, or gender-neutral affect each teen’s early childhood? 22. In all of the stories, personal pronouns are very important. What are your personal pronouns, and who decided what your pronouns would be? 23. Did reading this book change your understanding of gender identity? Why or why not? About the Author: Susan Kuklin is the award-winning author and photographer of more than thirty books for children and young adults that address social issues and culture. Her photographs have appeared in Time, Newsweek, and the New York Times. Susan Kuklin lives in New York City.